1st District Congressman David Davis issued a challenge on his website to debate his opponents in the GOP primary. But not long after GOP candidate Phil Roe agreed to the challenge, Rep. Davis changed his mind. He refuses to participate in the June 24th debate and worse, he tried to even remove his challenge, originally from his website in '06. Bad move. The most savvy blogger at DeMarCaTionVille, however, knows more about the Internet than Rep. Davis. As she says, maybe Rep. Davis is too busy counting all the PAC money his campaign has been collecting. "David Davis, candidate for the Republican nomination for the First Congressional District House seat, today challenged all Republican candidates to a series of debates. “The history of our election process in the First District shows us that debates have been a vital part of educating the voters to the issues and the stand of the candidates on those issues. These debates that I am proposing will help the voters to get to really know the candidates." Maybe he's afraid we all know too much already about him. Sure the challenge was on his website for over 2 years - but to try and erase all record of it ever being on his website shows someone's got some needs for those Internet skills. Says former Davis Campaign Manager, Keith Spicer, now working for Roe, writes: "David may be the incumbent, but the voters don't really know him. He should have taken this chance to prove that he is more than a window dressing conservative who has no real accomplishments to speak of. SIDE NOTE: I've been emailing Democrat Congressional candidate Rob Russell and should have an interview with him to post in the near future. A short selection of various interpretations of a single song. Happy Summer Solstice! A comment from yesterday's post pointed out a column by one Phil Valentine in The Tennessean and Phil says there is only one reason oil prices and oil drilling are a problem today: Democrats. Science, as I mentioned yesterday, points to some far more useful facts and not to these worn-out talking points of The Blame Game. "The only way to bring the gas prices down immediately is to drill. I realize that it would take several years before that oil would be in the pipeline, but the short-term effect would cause speculators to drive prices down." " A recent EIA study took a look at the impact that drilling in ANWR would have, and they concluded that it would probably reduce oil prices by 75 cents a barrel in 2025. A change that small two decades in the future almost certainly wouldn't have any effect on commodity traders today." "Between 1999 and 2007, the number of drilling permits issued for development of public lands increased by more than 361%. And did you see your gasoline costs drop? How about your electricity costs? Propane? natural gas? Uh...no. There is absolutely no correlation between the industrialization of public lands and the price of fossil fuels. It has been estimated that if all of those currently inactive leases were drilled, the USA would produce an additional 4.8 million barrels of oil and 44.7 billion cubic feet of natural gas EVERY DAY, accounting for a doubling of US oil production and a 75% increase in US natural gas production. The Minerals Management Service tells us that about 80% of fossil fuels available in offshore are currently available for development. What's going on here is yet another cynical attempt by the GOP and the oil and gas robber barons to increase and assure huge industry profits at the expense of the American people. These companies don’t want to drill these areas. They want to hold them as assests to limit the amount of oil and gas on the market so that prices rise still further - and they make more money." "There is more oil in Colorado than in the entire nation of Saudi Arabia"
But "oil" in Colorado is in the form of shale and not crude, so all comparisons are pointless. High gas fears (and their current realities) are merely ways to whip up fake outrage among voters. Seems Rep. Davis and columnist Valentine agree there is only one cause for wild speculation on the markets and the high prices at the gas pumps: Democrats. "The immediate, direct impact would, of course, be zero, since it takes years to bring new oil sources online. But what about the indirect impact that new drilling permits might have on perceptions of future supply? Might that help lower oil prices in the near term? Maybe, but it's unlikely. Take ANWR first. A recent EIA study took a look at the impact that drilling in ANWR would have, and they concluded that it would probably reduce oil prices by 75 cents a barrel in 2025. A change that small two decades in the future almost certainly wouldn't have any effect on commodity traders today. Offshore drilling is a little harder to get a handle on. Offshore reserves are larger than ANWR, which means their impact on oil prices would also be larger. The problem is uncertainty: even if the federal ban on offshore drilling were rescinded, that doesn't automatically mean there would be any additional offshore drilling. It just means individual states would get to decide what to do. California and Florida are unlikely to allow much offshore exploration, and other states on the Atlantic and Pacific coasts are question marks too." "Offshore oil reserves affected by the federal ban are estimated at 18 billion barrels, which is indeed larger than ANWR. However, EIA projects that offshore production rates would be about half of ANWR production rates, which means that lifting the ban on offshore drilling would probably have an even smaller effect on future oil prices than ANWR's 75 cents a barrel in 2025. In other words, "tiny" was probably the wrong word in my concluding sentence above. "Minuscule" is more like it. But the dog and pony show hit the media like it was a Bold and Beautiful Miracle. "Ban" is just more GOPer-speak. In reality, there is a moratorium on drilling in certain coastal areas. Other areas are not only open to drilling but leases and drilling permits have already been issued. And they are not being drilled. In fact, only 17% of the leased areas is in production. So, with about 33 million acres of offshore areas already available to drill and not being drilled, why does the oil and gas industry need to have access to still more? The fact is that nearly 25 BILLION barrels of oil off the coast of the United States is currently available for drilling...and industry is not drilling it. Not to mention natural gas. Most of the natural gas occurring offshore (over 328 TRILLION cubic feet – an eleven year supply at current consumption rates) is currently available for leasing and development. And they’re not going after it. This is the story throughout the country, more than 44 million acres of onshore public lands are leased for oil and gas development and yet most of it is not being drilled. All told (onshore and offshore), 68 million acres are leased and sitting idle. Over 10,000 permits are currently 'stockpiled' by industry. But still they want more. Between 1999 and 2007, the number of drilling permits issued for development of public lands increased by more than 361%. And did you see your gasoline costs drop? How about your electricity costs? Propane? natural gas? Uh...no. There is absolutely no correlation between the industrialization of public lands and the price of fossil fuels. What's going on here is yet another cynical attempt by the GOP and the oil and gas robber barons to increase and assure huge industry profits at the expense of the American people. These companies don’t want to drill these areas. They want to hold them as assests to limit the amount of oil and gas on the market so that prices rise still further - and they make more money. They want to hold on to these areas so that they can drill them ten or fifteen years from now and make an even bigger fortune." Just how is that government contractor KBR still gains hundreds of millions in tax dollars? "Efforts by defense contractor KBR to repair hurricane-damaged Navy facilities were deemed shoddy and substandard, and one technical adviser alleged that the federal government "certainly paid twice" for many KBR projects because of "design and workmanship deficiencies," the Pentagon's inspector general reported in an audit released yesterday." · The Navy entered into an illegal "cost-plus-percentage-of-cost" contract with the company. Higher costs meant more profit for KBR, which rewarded the company for "inefficiency and non-economical performance," the report said. · KBR paid $4.1 million for services and meals that should have cost $1.7 million, and it awarded sole-source or limited-competition subcontracts that overpaid hourly rates to roofers. · The company was paid nearly all contract amounts despite "marginal-to-average performance." The inspector general recommended that the Navy try to recoup about $8.4 million in "excessive" equipment lease payments and material profits, and another $1.4 million for more than 110,000 meals that were paid for and thrown away over a 34-day period. The audit report noted several unusual costs, including monthly employee cellphone charges of $540 during roof repairs, $720 per month in gas charges -- even as the Navy was already paying for work-site fuel expenses -- and expensive meals, including steak and eggs (full meal prices were redacted from the report)." NOTE: Southern Beale has more on this bizarre tale. "Potentially lethal electrical wiring problems on U.S. bases in Iraq have been known to military officials since October 2004. That’s when an official Army bulletin went out, citing the deaths by electrocution of two soldiers due to poorly grounded wiring. Since then, several more soldiers and Marines have been killed by faulty wiring and many more injured. The latest confirmed death was Jan. 2 in Iraq, when a Green Beret died taking a shower after a badly grounded water pump short-circuited. The blame for these deaths rests squarely on KBR, the American defense contractor responsible for base maintenance in Iraq and Afghanistan. There’s evidence that KBR was fully aware of the problems, did little to address them, fired at least one whistle-blower and may even have fabricated paperwork to make it look like proper wiring repairs had been performed when they hadn’t..
How much more worse will KBR have to perform before every contract they have with American taxpayers gets taken away? 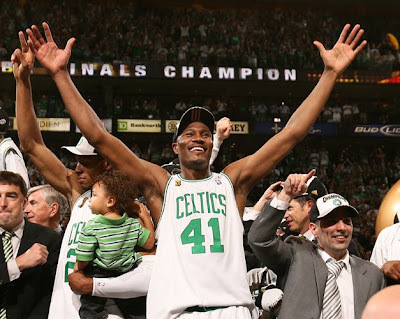 I seldom write about sports, but after waiting a few decades, I took much joy in watching the Boston Celtics win over the Lakers in the NBA finals yesterday -- their 17th win of the finals, more than any other NBA franchise. "Rooting for the Celtics is like saying Hitler was a victim. It's like hoping Gorbachev would get to the blinking red button before Reagan." How the heck Hill saw any wisdom to her claim is beyond reason. With 16 and now 17 titles to their claim, not to mention the longest winning streak - 8 back-to-back title wins, more than any sports organization in North America - Hill needs some basic world history training and sports history training, too. I became a Celtics fan back during the 1976 NBA finals. That Game 5 triple-overtime game is likely one of the best NBA games ever and one which inspired me for many years. It isn't June in my mind unless the Celtics are in the Finals. And ya know what, it is a fine, sweet June in 2008. Did I have to wait a long time - since 1986 - for the Celtics to win the title again? Yes. Did the 2008 Celtics drill the Lakers in 2008? Yes. Does Hill need to eat giant heaping plates of crow? Yes. A D.C. judge has ruled that the White House can keep hiding their emails, declaring the group tracking and holding the documents are a "non-agency." Just ignore the previous 30 years of law. "After initially agreeing to provide records, OA changed course and claimed it was not an agency and, therefore, had no obligation to comply with the FOIA. OA made this claim despite the fact that even the White House’s own website described OA as an agency and included regulations for processing FOIA requests. While acknowledging the question is a close one, Judge Kollar-Kotelly has found that OA is not an agency on the grounds that it does not exercise substantial independent authority. OA has admitted that it functioned as an agency and processed FOIA requests until August 2007. Although CREW filed its FOIA request in April 2007 – four months before OA changed its position – the court found that OA had no duty to respond to CREW’s FOIA request because OA was never an agency in the first place. "For 30 years, the Office of Administration has been subject to FOIA. But once they discovered that the Office of Administration may have paperwork showing how or why the Bush administration was able to dispose of millions of possibly incriminating emails, the White House conveniently decided the office was no longer subject to FOIA." The usual laws mean nothing under current White House leadership. Just keep moving the records around until enough delays take place to muddy any investigation. The Decider is, after all, The Decider. The first rule about Congressional Elections in the 1st District is - You don't talk about Congressional Elections in the 1st District. Instead we have a fierce word battle between the managing editor at the Bristol Herald Courier, Todd Foster, and a Hank Hayes, reporter for the Kingsport Times News, over a BHC report about Congressman David Davis. "Kingsport Slimes News Lives Up To It's Reputation"
"Kingsport Times-News reporter Hank Hayes has a bright future flacking for politicians. Lord knows, he’s better at it than at journalism. Hayes used the news columns of his newspaper on Thursday to attack an investigative article we published a week ago about U.S. Rep. David Davis, R-Tenn., and his congressional earmarks. That same day, we published an editorial that noted the amount of special-interest money Davis was socking away." "MY ADVICE to Hayes is to cash in on his boosterism. If Davis does the right thing and fires his press secretary, Ryan Tronovitch, as we editorialized he should on Friday, then Hayes could at least join the Davis payroll officially. Why did we call for Tronovitch’s firing? THE URL quickly was removed by Davis’ staff after Hayes’ article quoted me as saying the “bhcjerks” reference was immature and undignified. Notice that learning the English language was not included on Tronovitch’s list. Many of the Davis news releases under Tronovitch’s byline include rampant misspellings. (Note to Ryan: There’s a new invention out; it’s called SpellCheck. You might want to use it.)" Sadly, while the media is reporting on itself, no other news media are checking into the allegations about Rep. Davis taking money from a business he then worked to get a government contract for ... that's not news, I suppose. And yes, there are other candidates for the office of 1st District Congressman. Yet, past history shows that voters will simply look for a Republican to vote for, and they'll likely vote for the incumbent first, regardless of any allegations. I did enjoy my extended stay in Wonderland, where there was little to no talk at all of politics and the Internet was merely a place to find music, see funny videos, and talk to friends. I did take note that it does seem most expensive to live at the technological level - a 12 year old with iPod, cell phone and portable gaming devices is a 12 year old with working parents who dole out many dollars. I'm so old, I remember when it was a tough job just to remember my home phone number, games came in a cardboard box, and the best musical devices were also home furniture and were called "consoles."